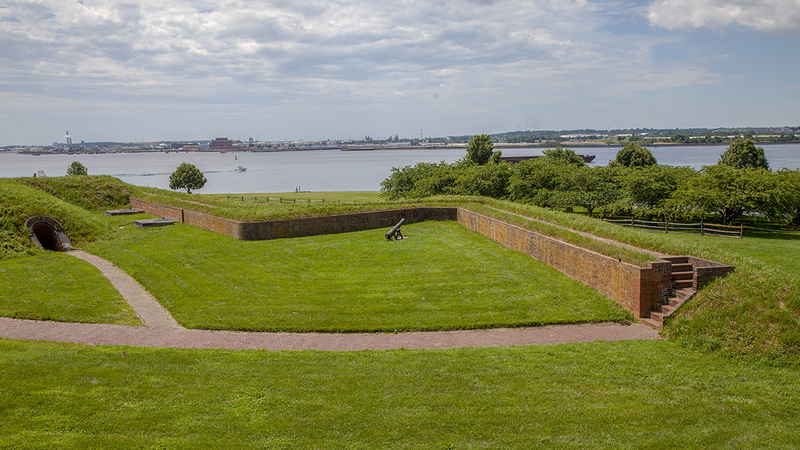 This coastal fortification gained fame when it survived an overnight bombardment by the British navy in September 1814, inspiring Francis Scott Key to write the poem that later became the U.S. national anthem. 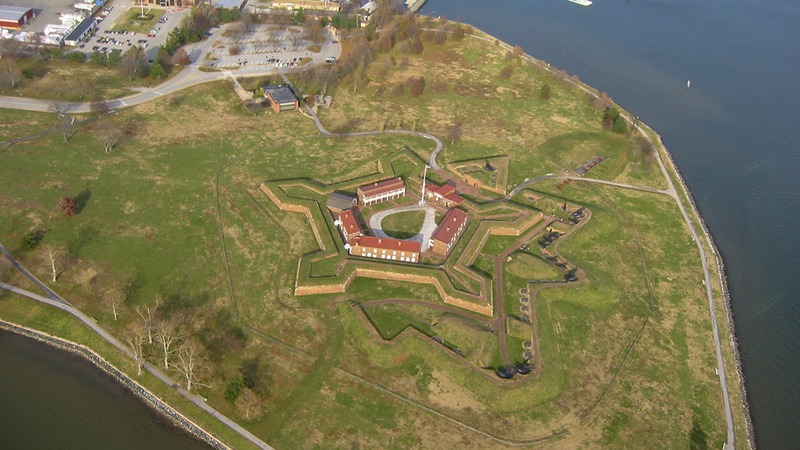 Notable for its earthen and brick ramparts in the form of a regular pentagon with a bastion at each of its five points, the fort was designed by French civil engineer Jean Foncin. 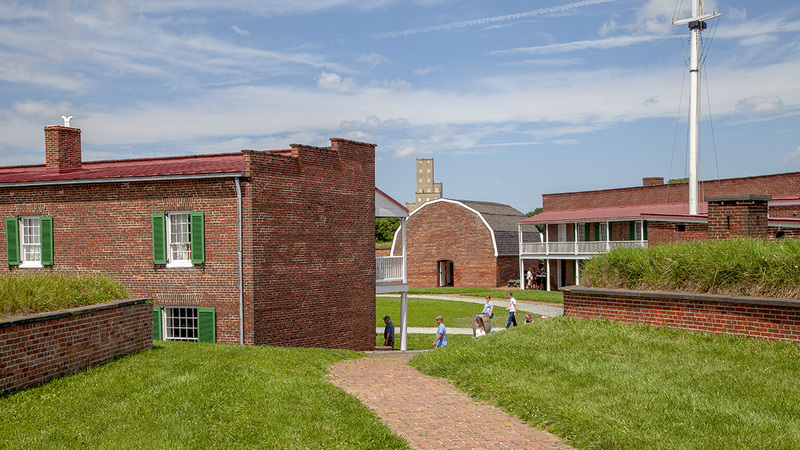 Completed in 1803, it occupies the eastern tip of the peninsula formed by the Patapsco River, previously the site of the Revolutionary War-era Fort Whetstone. 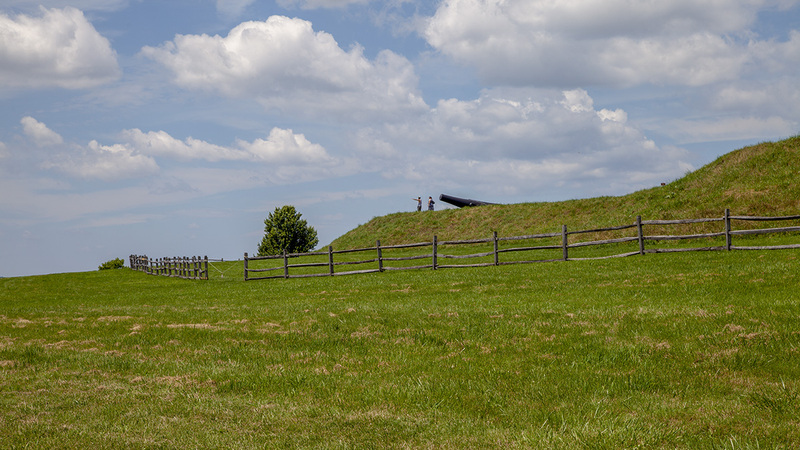 The battlements enclose a parade ground, barracks, a guardhouse, and an ammunition magazine. A V-shaped ravelin, added in 1813, extends from the fort’s primary entrance and points northeast. Added in 1836, an outer array of breast-height earthen walls wraps from the ravelin to the southwestern point of the fortification. 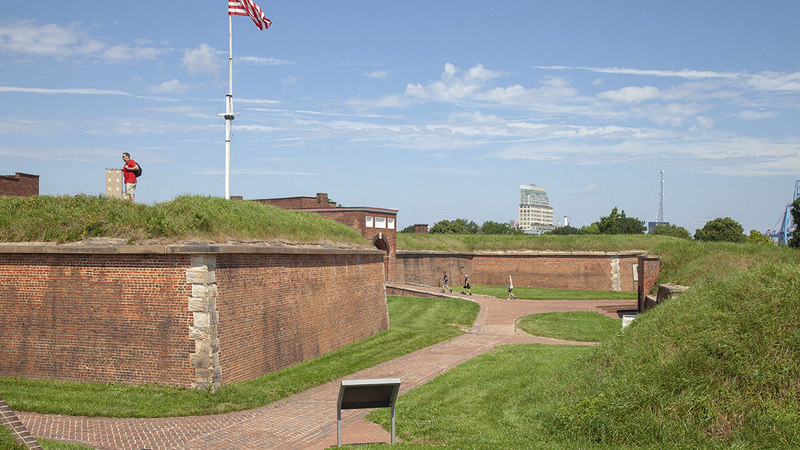 In addition to protecting Baltimore and its harbor, the fort served as a military prison during the Civil War, a public park in the early twentieth century, a hospital during World War I, and a Coast Guard training center during World War II. The overall spatial organization of the nineteenth-century outpost and its secondary structures remains intact. 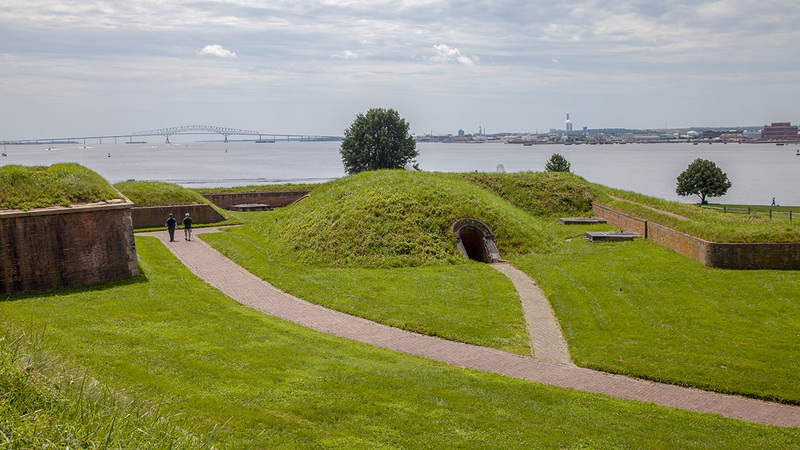 The fort’s sodded earthworks drop into mostly open lawn, which slopes slightly downward as it extends to the seawall; canopy trees with limited understory grow in clusters at the water’s edge of the 43-acre site. Statues of George Armistead (the fort’s commander during the 1814 battle) and the Greek figure Orpheus stand apart from the fort, the latter referencing the site’s role as inspiration for Francis Scott Key. 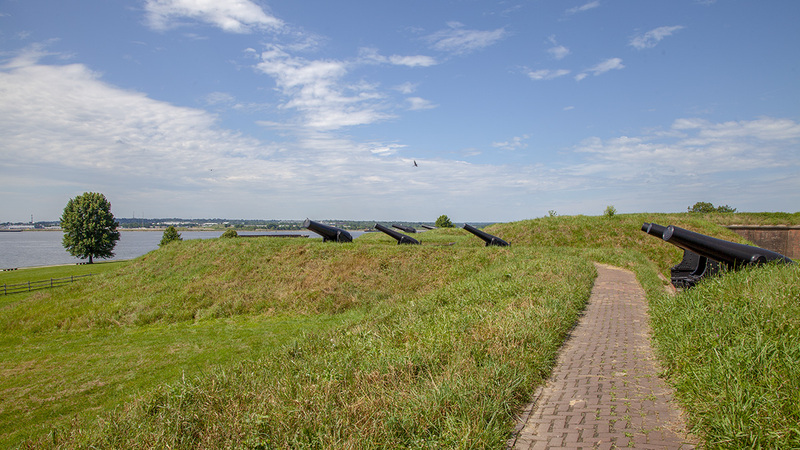 Curvilinear pedestrian paths traverse the landscape and provide access to the visitor center, fort, and grounds along the seawall. 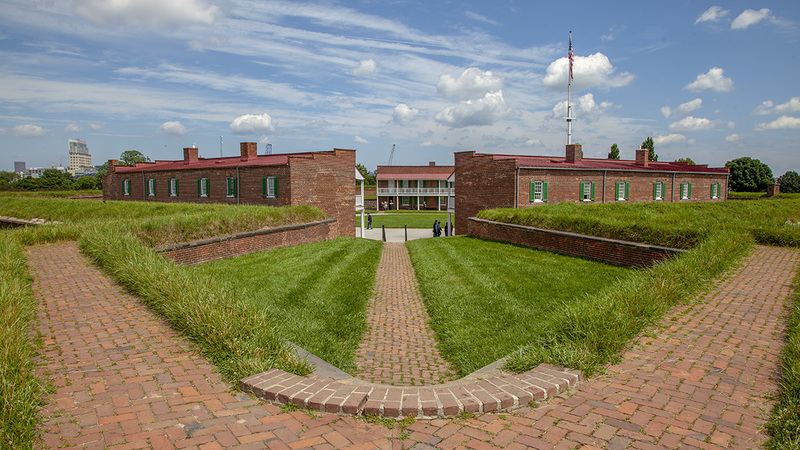 Fort McHenry has been a national monument and historic shrine since 1939 and is now managed by the National Park Service. The site was added to the National Register of Historic Places in 1966.